Portable oxygen cylinder is meant for on the go usage for persons suffering from low oxygen levels. Oxygen is packaged in small canisters that weigh around 100 grams. Humans require adequate oxygen in order to perform at our best levels. Portable oxygen cans are used for raising your oxygen levels in case there is a dip in the oxygen level. 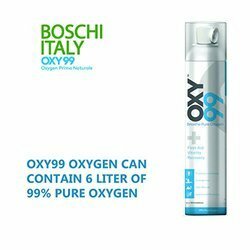 OXY99 Pure Oxygen is a Lightweight Portable Can Developed by ING. L. A. Boschi of Italy (Since 1930). Useful For Sports Recovery, Breathlessness Due To Respiratory, Pollution, And Altitude First Aid Is Life Saver. You suffer from lung or respiratory disorders such as Asthma, C.O.P.D, etc. Helps you recover from breathlessness suffocation caused by pollution, smoking, stale air, poorly ventilated rooms, high altitude, etc. Usage Medical, Hospital, Clinic, Personal, Sports, Fitness, High Altitude. Portable oxygen cylinders are considered effective for offering oxygen supplement to raise oxygen level in your blood. In case the oxygen in the blood falls below the normal levels, you are exposed to the dangers of diseases and health problems. We require adequate level of oxygen to function at our best levels and the oxygen cylinder contains 99% pure enriched oxygen we can breathe to raise the level of oxygen in our blood. Around 89% of the metabolic activity in our body is caused by oxygen. It goes without saying that portable oxygen cylinders offer the best solution for increasing your energies instantly. Portable oxygen cylinders are also used by sportspersons for raising their performance levels. Upon inhaling from the oxygen cans, you will experience that effectiveness of the canned oxygen is instantaneous. The portable oxygen canisters can also act as lifesaver if someone suffers a heart attack or meets with an accident. Oxygen level in our atmosphere is also getting affected by pollution and over-crowded cities. In such a scenario, inhaling from an oxygen can is quite beneficial. Disposable oxygen cylinder is a perfect product for offering oxygen supplement to raise oxygen level in your blood. When the oxygen level falls below the normal level, you are exposed to numerous diseases and health problems. We need adequate level of oxygen to function at their best level. 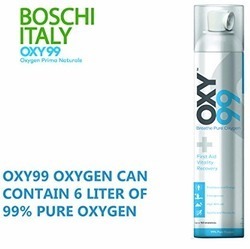 Disposable oxygen cylinders contains 99% enriched pure oxygen we can breathe to raise the level of oxygen in your blood. Oxygen is responsible for almost 89% of the metabolic energy generated in the body. Supplemental oxygen is the best solution for increasing your energies and performance as inhaling from the oxygen tank increases your energy instantly, strengthens immunity, and increases physical strength and mental alertness. It is also effective for patients suffering from breathing disorders such as COPD, hypoxia, hypoxemia, OHS, etc. Disposable oxygen cylinder is also very helpful for sports persons for raising their performance levels. It is effectiveness in replenishing depleting oxygen levels is instantaneous. Disposable oxygen cylinder is a lifesaver in case someone meets with an accident or suffers a heart attack. Oxygen cover is getting depleted due top pollution and over-crowded cities. In such a scenario, using canned oxygen has become almost imperative for everyone living in polluted cities full of smog and dust particles. Useful For Sports Recovery, Breathlessness Due To Respiratory, Pollution, And Altitude First Aid Is Life Saver useful For Sports Recovery, Breathlessness Due To Respiratory, Pollution, And Altitude First Aid Is Life Saver.. You suffer from lung or respiratory disorders such as Asthma, C.O.P.D, etc. Helps you recover from breathlessness suffocation caused by pollution, smoking, stale air, poorly ventilated rooms, high altitude, etc. Portable oxygen cans offer an effective source for increasing your oxygen level if there is a dip in oxygen. Oxygen helps in oxidizing food releasing energy and heat and we need oxygen in adequate measure in our blood levels to function at our optimum level. Patients having low oxygen level can lead to fatigue, stress and depression. There is no denying the fact that portable oxygen can is best remedy for restoring oxygen level back to normal in case there is depletion in oxygen in your blood. 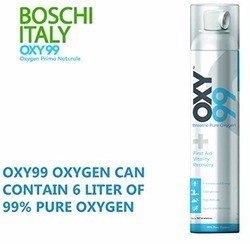 Portable oxygen cans are packaged in aesthetically designed cans that weigh 100 grams and contain 6 liters of oxygen. Supplemental oxygen is also an effective option for patients suffering asthma, COPD, cystic fibrosis, pulmonary fibrosis, chronic asthma, etc. Quality of oxygen is decreasing day by day, especially in big cities, and there is no best way to meet your oxygen requirements because of rampant pollution. Many patients afflicted with breathing disorders will also find inhaling from portable oxygen cylinders beneficial. Inhaling from the oxygen cans would raise the low oxygen level back to normal. Sustaining vital functions of the body needs sufficient supply of oxygen in the bloodstream. One can buy portable oxygen cans for curing respiratory diseases and conditions including asthma, hypoxia, hypoxemia, COPD, influenza, emphysema, cluster headaches, breathlessness, etc. Looking for Portable Oxygen Cylinders ?